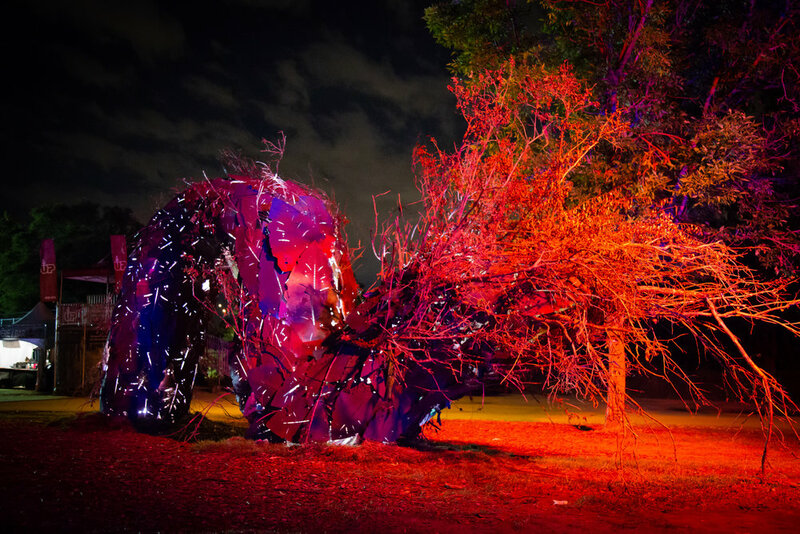 Glow Worm (Pipe Dreams) is part of Osheaga’s permanent collection as of 2017, installed annually at the festival site. With three sections, six industrial lights installed, and an approximate height of two stories tall, this piece was erected in a mere two weeks (with very little sleep.) Over 600+ birch panels were lasercut by Sarah, brought onsite, painted, waterproofed, and secured onto the frame with her fabrication team. It is a known fact that the Mammoth Glow Worm resides in the center of the earth... and possibly visits you in your dreams while you sleep. According to leading earthworm experts, however, this large-and-in-charge cousin to the arachnocampa luminosa actually does surface on an annual basis. Research has shown that its migratory patterns involve attending music festivals; namely, Osheaga and Picnik Electronik, held annually in Montréal. Despite its formidable size, it remains mysteriously stoic during the glow worm's time spent above ground.